Husqvarna 240 vs Stihl 170: Which One's Best? Husqvarna 240 vs Stihl 170: Which One’s Best? Yankees vs. Red Sox. Ford vs. GM. Coke vs. Pepsi. McDonald’s vs. Burger King. These brand wars all have their devoted, passionate partisans. We’ll add Husqvarna vs. Stihl, a brand war that touches a more specialized subset of American consumers — users of chainsaws. Both brands have their devoted partisans who insist that the quality of the other has begun to flag in recent years, while theirs is as excellent as the day of the company’s founding. 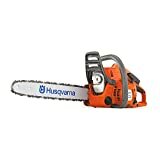 That includes today’s comparison between each brand’s respective lightweight, highly portable chainsaws intended for pruning and other light work around the yard. Once you get past the brand loyalty, you find that both saws aren’t all that different. Today, price and availability are why we’re handing the trophy to the Husqvarna 240. The Husky, with a 38.2 cc engine, is noticeably more powerful than the Stihl’s 30.1 cc engine. For what these saws are designed for, as long as you use a sharpened blade, the difference is pretty marginal. These are chainsaws built for portability and precision, not raw power. Both deliver pretty equitably in performance. For chainsaws intended to do pruning and light work around the yard, portability is almost as important as performance. You don’t need to overpower limbs, but you do need to cut them right where you want to cut them. The Stihl weighs eight pounds without cutting attachments, while the Husqvarna weighs just over 10. This isn’t do-or-die territory, but over the course of the day it could change the user fatigue dynamic slightly, to where Husqvarna users would require a little more down time for rest. We like Stihl’s smart carburetor that adjusts the oil/fuel mixture depending on how much air is getting to the filter. That means it can operate for longer in a dust-heavy environment before you need to take a break to clean it out. However, we got basically the same function out of Husqvarna’s air injection system, which traps large particles before they get to the air filter. While taking different paths, both saws end with performance that is unimpeded by ambient debris for longer. Both saws are very similar in their rear-handle designs and their features to reduce user fatigue. The Stihl’s slightly lighter weight gives it a slight edge, because over the course of a day, that will lead to lower user fatigue. That advantage is small compared to the fact that both saws have similar features to reduce vibrations during use. Those vibrations cause more fatigue than raw weight. There are two primary ways that price figures into a purchase decision. Either the two items being compared are otherwise nearly identical in performance, or the price difference is so great that it makes performance issues secondary. In this case, it’s the first. Both saws deliver in reliability, ease of use, and overall performance. Both would serve you well. However, Husqvarna’s is less expensive, to a degree that won’t be bridged by a short-term hiccup in sticker price. You might be able to cobble together discounts, rebates, and store/manufacturer sales to eliminate this as an effective difference maker, or you might be able to find a refurbished model or a model with aesthetic defects. People are attracted to old-fashioned notions like mom-and-pop stores and local retail. Lots of people like Stihl because the brand hasn’t sold out to big box stores. This, to them, smacks of quality. Selling out not only means no personal relationship with the salesperson, but also that the manufacturer had to reduce quality to meet higher demand. There’s a term for this idea: outdated. Stihl doesn’t sell through big box retail outlets, and you can’t buy its chainsaws on the Internet. That makes it a special hassle to get Stihl products, and it’s based on an obsolete loyalty to nostalgia. The 240 gets the nod here. Husqvarna’s 240 is an excellent chainsaw for light work like pruning limbs. It’s light, accurate, and comfortable. It’s also less costly than its competitor and, most importantly, more readily available. You don’t need to spend time hunting for a licensed retailer and hoping there’s one nearby. If you can find it at one, that’s great. If you can’t, you can still order it online and have it brought to you. In a globalized marketplace, there is no reason for home chainsaws to be available only through licensed retailers. Stihl still goes that route. It’s a great saw, but it’s not so much better than the Husqvarna that it makes the extra hassle worth it. These models are basically the same saw. The difference is that Husqvarna’s business model is superior. We’d all like to think that the better chainsaw is the one that can just flat-out outperform the competitor. That’s not really the case here, however. We have to give the nod to the chainsaw that is more affordable, and even more importantly, more easily available. People are attracted to the idea that a saw you can look at before purchase is always a better buy, but that’s not really the case. Perfectly serviceable, reliable power tools are available at big box retailers and even on the Internet for less money. In this case, Stihl’s price and relative difficulty in buying one are deal breakers.